So when it comes down to it, I think we all know that one of the most enviable things about mermaids are the flowing locks that whirl about them in the sea and allow them some small bit of modesty when washing up, toplessly, on land. 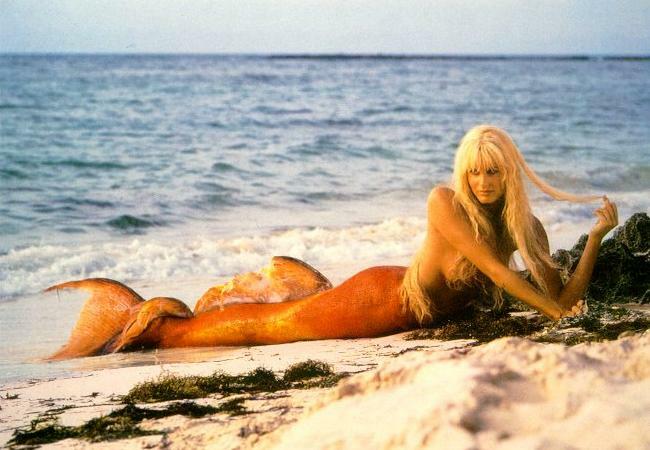 A mermaid’s hair is absolutely part of her allure, which is why she’s always sitting about on rocks combing it (or hanging out on beaches running her own hands through it, a la Daryl Hannah) and sticking things like starfish into it, and then gazing at herself in mirrors while sailors crash their ships around her. It is also the mermaid’s most human attribute; whilst we humans and/or aspiring mermaids may have a hard time getting to the bottom of the ocean or changing our legs into a giant fish tail, we can get mermaid hair. Though sometimes only with the help of a professional. So I asked one of my own favorite hairdressers, Tabatha Coffey of Tabatha’s Salon Takeover fame (a show in which Tabatha, fairy godmother-style, goes into failing salons and is mean to everyone and bashes them into shape until they are awesome and transformed and crying), for some mermaidly advice. Here is what she said. How can an aspiring mermaid get mermaid hair? Do you have any favorite mermaidly hairstyles or styling tips? Create loose tousled waves by using a large curling iron and taking random sections of hair and waving them, then run your fingers through to create that beautiful mermaid texture. What about color – is there anything an aspiring mermaid can do to add more magical ocean allure to her locks? I think mermaid hair is all about being luscious, whether blonde, red or brunette, it’s about shine and vibrancy. Can you recommend any hair accessories/products to add extra shimmer and shine? There are many great lightweight shine serums and sprays available to put shine and gloss on the hair. My tip is to use them sparingly and make sure you emulsify through your hands well before applying as they can weigh hair down or make it look greasy. If using a spray shine do the arms length spray (meaning spray from an arms length away) so you don’t weigh hair down. How can an aspiring mermaid protect her hair from too much exposure to saltwater, the sun, and/or chlorine if she is sadly confined to pools and bathtubs? Mermaids need to protect their beautiful locks from the elements so using products that condition and protect is really important. There are some great leave in conditioners to wear to the beach and protect the hair from sun exposure but remember to reapply as you would any sunscreen. If chlorine is your thing wet your hair before getting in the pool, the moisture in your hair will stop it from absorbing so much chlorine. A clarifying shampoo weekly followed by a good conditioner will also help all the chlorine swimming mermaids out there. Can you think of any examples of celebrities, etc., with especially effective mermaid hair? Kim Kardashian has beautiful hair any mermaid would envy. Elle MacPherson has the waves a mermaid would envy. Taylor Swift works the mermaid look. Are you yourself a fan of mermaids? If so, how would you describe their allure? I think the myth surrounding the siren of the sea is the allure and come on who didn’t like Ariel!! Embrace the spirit of the mermaid, which to me means being mysterious. If that fails, stay wet and keep your tail up! OK, so I actually grew my hair down to my waist because one day when I was twelve or so, I was in the pool, and I thought it would be amazing to pretend to be a mermaid. But I needed long hair for that. Yeah, really dorky. But mermaid hair is awesome.